After you’ve filed almost any application or petition with U.S. Citizenship and Immigration Services (USCIS), they will respond by mailing you a Form I-797C, Notice of Action, within approximately 1-3 weeks. (It may take longer to receive the I-797C for some other forms like Form I-751.) 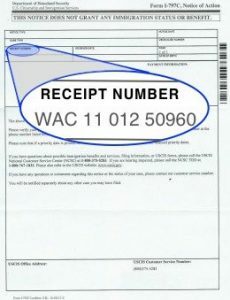 The I-797C, Notice of Action, is commonly known as a receipt letter. For applicants that have incorrectly filed or included the wrong payment, this receipt letter will indicate that the case has been rejected. The applicant will need to refile. If you’ve prepared the form correctly and followed the USCIS directions carefully, this receipt letter will indicated that your case has been accepted. Once the form has been accepted, USCIS will begin reviewing your case. The receipt letter contains a unique 13-digit receipt number. Also known as a case number, it’s a very important number to help you track the progress of your case or identify a particular immigration filing. It’s not necessary that you understand the details of how to read a USCIS receipt number. But you may be curious. It can be very helpful to understand the basics so that you are aware of your case’s location and timeline. 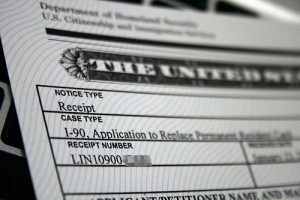 If you submitted a visa petition, adjustment of status, green card renewal, citizenship application, DACA or almost any other USCIS form, the receipt number will allow you to more easily track the status of your case. Each of the 13 digits in a USCIS receipt number has a specific purpose. Here’s how to read a USCIS receipt number. The second set of digits represent the fiscal year that the case was received. Government agencies use a fiscal year that is different from the calendar year. It begins on October 1 and ends on September 30. So our example case number was opened between October 2010 and September 2011. The third set of digits indicates the computer workday that the case was opened. The computer workday is basically the same thing as a workday. Therefore it excludes most weekends and holidays. Our example case was opened on the 12th workday of the 2011 fiscal year (October 18, 2010). The final set of five digits is the case number. Go to the Check Your Case Status page on USCIS.gov. Enter the entire 13-digit number without spaces. Click the “Check Status” button and view the results. If you have lost your receipt letter with the USCIS receipt number, it can be recovered. Schedule an InfoPass appointment with USCIS. An InfoPass appointment is made through the USCIS website. Generally, it’s the only way to get face-to-face access to a USCIS employee. In most cases, you will not be able to enter a USCIS facility without an appointment. At your InfoPass appointment, you can ask questions about your case and request your receipt number if necessary. Take your passport or other valid identification documents to the appointment. If you choose not to access your USCIS online account, USCIS will still process your application in USCIS ELIS. You will receive notifications and updates about your application by mail through the U.S. Postal Service. CitizenPath provides simple, affordable, step-by-step guidance through USCIS immigration applications. Individuals, attorneys and non-profits use the service on desktop or mobile device to prepare immigration forms accurately, avoiding costly delays. CitizenPath allows users to try the service for free and provides a 100% money-back guarantee that USCIS will accept the application or petition. We provide support for the Citizenship Application (Form N-400), Green Card Renewal (Form I-90), and several other popular forms.